With mobility (Mobile Twinning) becoming such a common part of life for workers, IP Office can do this with ease, even on Essential Edition. Remembering that everyone can have Mobile Twinning for free, once the platform is licensed for Essential Edition and higher (Essential, Preferred and Server Edition). As you can see by the above table, we need to assign every feature we want to use, to it’s very own DID number. Once set up, you just call that number to activate the feature. For instance, to turn o Twinning, you would dial 513-555-1017, from the phone number that is set up for mobile twinning….soo lets look at the IP Office side of things. First, we need to set up the user for Mobility. 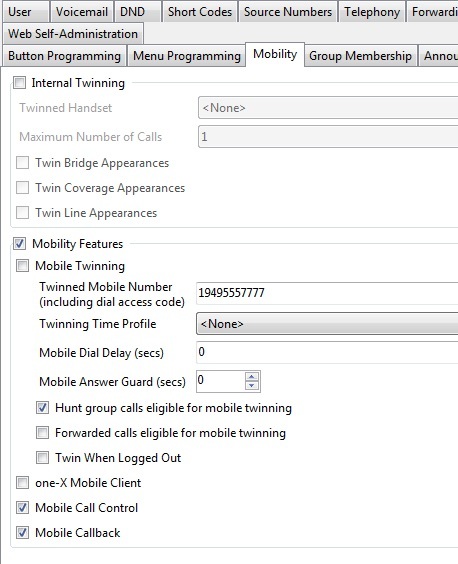 On the Mobility tab, check the user to enable twinning, and put the phone number in. 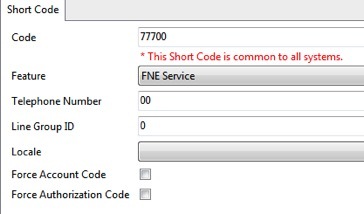 The user can change it, but if there is not a number set up, the FNE codes will not work, as it checks the Caller ID to see what user is trying to authenticate this FNE code. So the Caller ID, must match what is in the twinned number field, or you will get wave off tone. Now we need to create short codes for all the FNE codes we plan to use. Obviously you could use all the codes, which would use a lot of DID numbers. If you only need ten of the features, then you would only need 10 FNE codes, ten Short codes and ten DID numbers. Below is a sample short code. 77719 is what we will direct the incoming call route (or DID number) to. The feature is FNE Service, and the Telephone number is 19, which is the FNE feature number we want to use. NOTE: if using FNE codes 0-9, I need to use 2 digits so FNE 0 would be 00, or 1 would be “01” and so on. Now, the last part is to set up an incoming call route to the short code. In our case, to turn on Twinning, we would set up an incoming call route for 513-555-1000 to route to FNE Short code 77700. So, if I call from my cell phone, which would be 1-949-555-7777 (fictional number) into 513-555-1000, I would be triggering Short code 77700, which is FNE code 0 for remote dial tone. Again, the incoming caller iD, MUST match what I have in the “Twinned Mobile Number” field for the user. If that does not match, non of this will work. When you dial in, the user restrictions that are tied to that “Twinned Mobile Number”, will be in place. So if this was for Bart at extension 2461, the same restrictions apply to the cell, that are applied to the extension. For example, if Bart can not dial long distance from his desk, he will not be able to dial long distance by dialing in to 1-949-555-7777, and getting dial tone from the IP Office.